IRC stands for "Internet Relay Chat". It was originally written by Jarkko Oikarinen in 1988. Since starting in Finland, it has been used in over 60 countries around the world. 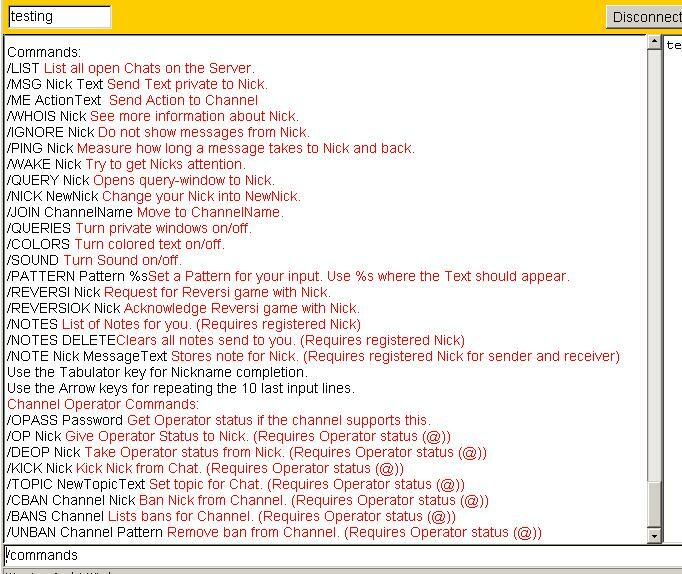 IRC is a multi-user chat system, where people meet on "channels" (rooms, virtual places, usually with a certain topic of conversation) to talk in groups, or privately. There is no restriction to the number of channels that can be formed on IRC. The IRC Server is like a big building or hotel, with many rooms in it. People with similar interests gather at one of these rooms. The sports fan gathers in the gym, the women at the beauty-saloon :) and so on. On the chat there are also 'channels' i.e. rooms where people with similar interest gather to have a chat. If you get bored at the gym or get tired you can leave to visit the bar, in a similar fashion you can leave a 'channel' and join another that suits you more at that time. All commands will be explained on this page. 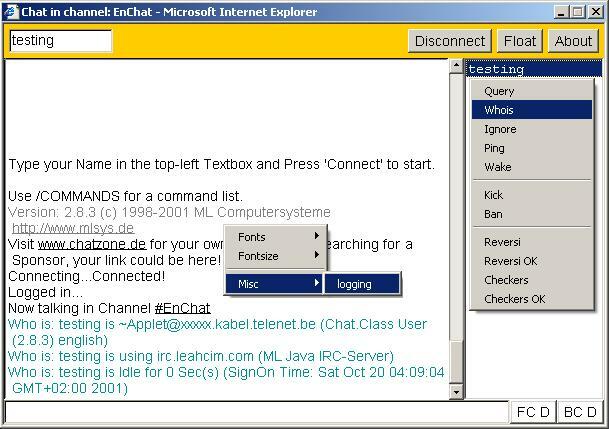 Leahcim Javachat is offering IRC services since 1996 and has been the starting place of many and still houses people from all over the world. Leahcims IRC Server is web oriented, the client ( a Java Applet ), nickname registration, channel registration are all handled with a web interface. Conventional IRC clients such as mIRC are not allowed. This doesnt mean it has less functionality, as we are going to see later its much easier and has also tons of features. This page will help you get the most out of Leahcims Javachat. 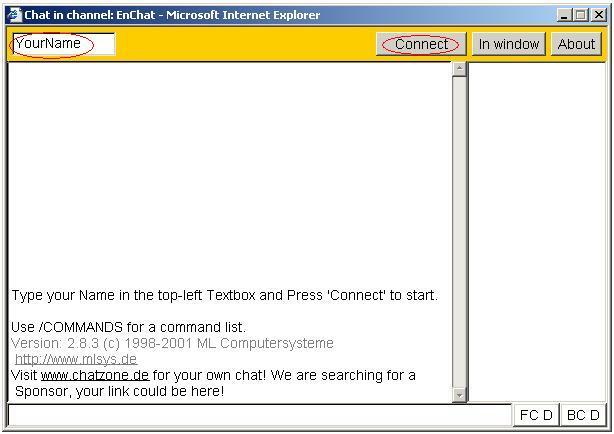 If this is your first time you visit Chatzone.de this page will get you going in a flash. Additional topics may be added later. When you visit Chatzone.de you have the option to 'quickchat' in a language. Slide your mouse over your language it will be highlighted. And click on it, a new window will popup. In the Applet window type your nickname in the top-left TextBox and press 'connect' to start. 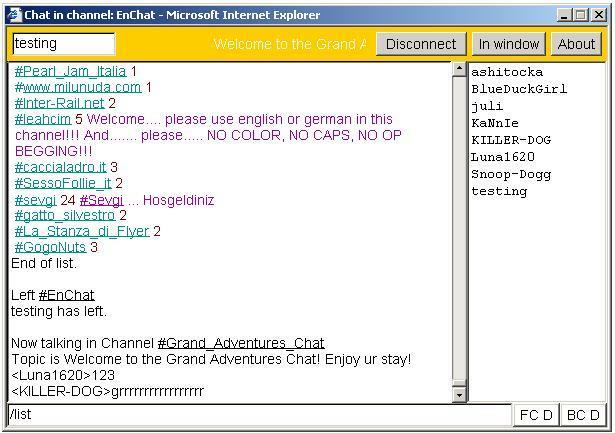 The big frame on the left is the main chat window, all typed text goes in the 'channel' wich means every user can see it. Commands are also issued in this window. The smaller frame on the right is the nickname list. All users present in the 'channel' are visible on the nickname list. Double-click a nickname for a private chat session. Type /list ( the slash included ) and you will get a list of channels running on the server. Click on the channel of your choice and you will be joining that channel. The floating text on topof the main window is the 'channel topic' wich means people are probably talking about that topic. 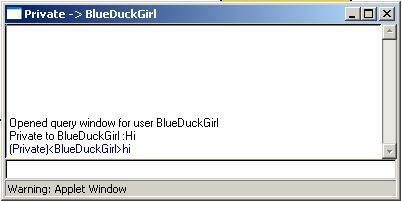 If the topic discussed in the main window doesn't fit you, you can allways try to have a private chat with someone. Just double-click on a name on the 'nickname list' and say Hi. Don't expect everyone to answer, everyone has the right to chose with whomever he/she wants to have a private chat. 'Personal Settings' can be used to create a default nickname, default channel, default colors etc. If you save these settings they will automatically be used everytime you visit chatzone.de. On the main page click on 'personal settings' on the left frame. The "Personal Settings" window will open. These selected settings will also be used for 'quickchat', so you won't need to fill in your nickname if you select 'quickchat' or 'list channels'. IMPORTANT NOTE : ALL IRC COMMANDS START WITH A "/". The forward slash is the default command character. Commands on IRC are not case sensitive, and can be issued in the main window or in the private chat window, all output is in the main window. Anything that does not begin with "/" is assumed to be a message to someone and will be sent to your current channel, or to a person you are chatting with in a private chat. The only command you will need to memorize is "/commands". When you issue this command you will get a list of available commands on the chat with their explanation and usage next to it. The picture above shows all the commands, pretty self-explanatory. If you have a registered nickname and didn't set your personal settings use "/nick newnick password" for example: /nick Harry coolpwd521. Popups are accessed by right clicking on the main window or on a nickname. Popups can be used to adjust channel settings or to issue commands. Right clicking on a name in the nickname list followed by selecting 'whois' from the popup menu will do the same as the command '/whois nick'. All output is in the main window. The rest of the nickname popups work in a similar way for example selecting 'ping' from the menu will do the same as the command '/ping nick'. Right clicking on the main window will bring up a popup where you can adjust channel settings such as fonttype and fontsize. Select the font or fontsize you want and it will change instantly. The Applet supports also logging of conversations. Right click on the main window and select logging, a new window will open. All text generated by the Applet will also appear on this new window, you can copy text from the window by selecting text and pressing "CTRL+c". The copied text can be pasted into another application or a new document using "CTRL+v". Once you are done logging generated text right click on the main window again and from the popup select logging again, this will disable logging and close the log window. Q: What is a nickname ?. Answer: On IRC you are known to others by a nickname. You are free to choose any nickname you like, up to 20 characters long. Do not use spaces and avoid unusual ASCII characters in your nickname. It is also very common to find people that use the same nickname and you may be asked or forced to switch nicknames to avoid confusion. Q: What is my IP Address ?. Answer: Your IP Address is the address your PC uses on the Internet. It is usually a set of 4 numbers or its equivalent IP Name. Some providers offer you a unique IP Address (static IP) or they assign a different one every time you connect (dynamic IP) to them. All communication over the internet is via IP Addressess, every computer has it's own unique IP Address. Think of it like a phone number. Q: What exactly is a channel ?. Answer: A channel is a 'place' on IRC where group conversations occur. People can join the same channel and see each other. Depending on its topic and time of the day a channel can be crowded. Channels can also be quite chaotic, or calm. Channels can be open to everyone but also closed and private and only open to friends. Channels on IRC are dynamic in the sense that anyone can create a new channel by joining a non-existing one, and a channel disappears when the last person on it leaves. Once connected, type /list to see all existing channels. All channel names start with a #. Q: What language should I speak? How do I behave on the Chat ?. Answer: The most widely understood and spoken language on IRC is English. However, as we have different users from all over the world, English is by no means the only language. If you want to speak some language other than English, (for example with your friends), go to a separate channel and set the topic to indicate that. Similarly, you should check the topic when you join a channel to see if there are any restrictions about language. On a non-restricted channel, please speak a language everybody can understand. If you want to do otherwise, change channels and set the topic accordingly. Harassing another user. Harassment is defined as behavior towards another user with the purpose of annoying them. Annoying a channel with constant beeping ( wake ). Any behaviour reducing the functionality of IRC as a CHAT medium. Q: What is a channel operator? What is a Server Operator ?. Answer: A channel operator (ChanOp or Op) is someone with a "@" by their nickname in a channel's names list. Channel operators are the 'rulers' of a particluar channel. This means they can kick you out of their channel for any reason. If you don't like this, you complain to them or start your own channel and become a channel operator there yourself. A Server operator (IRC Administrator) is someone who maintains a server. In most cases they cannot fix channel problems. They cannot kick someone out of a channel for you. They also cannot /kill (disconnect a user from their IRC server temporarily) someone just because you gave the offender channel operator privileges and said offender kicked *you* off. Server Operators have better things to do than interfere in channel affairs. The only interference will be when users arent able to deal with the harasser (/ignore) themselves. Q: How do I create a channel?. Answer: A channel is automatically created as soon as the first person joins it. If you join a channel and you find your name as the only one there, you just created that channel. 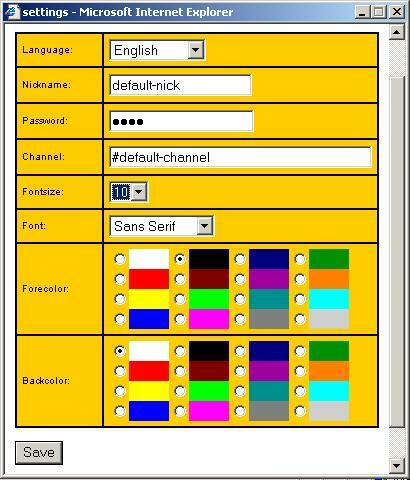 Channels on IRC are dynamic in the sense that anyone can create a new channel, and a channel disappears when the last person leaves it. Alternativly you can register a channel for your website, wich makes you the 'owner' of that channel here. Q: Someone is using my nickname, can anyone do anything about it?. Answer: You can register a nickname if it isn't already taken here. Or you can ask for them to give it back, but you can not *demand* it, nor will Server operators /kill for nickname ownership normally. Q: Someone is using my channel, can anyone do anything about it?. Answer: There are, literally, millions of possible channel names, so if someone is on your usual channel, just go to another. You can /msg them and ask for them to leave, but you can't *force* them to leave. Register a channel if you want to 'own' it. Q: Help! Someone kicked/banned me from a channel. Whom do I complain to? Answer: The answer to this question is the current channel operators, and them alone. Given the dynamic nature of channels, channel operators do not need to have a *reason* to kick you off. They decide what goes on in the channel. Complaining to Server operators about being kicked or banned from a channel is considered extremely childish, and will not result action. Server operators do not meddle with channel politics - that's the job of channel operators. If you should get banned or kicked from a channel, you are always free to start your own channel and decide what is appropriate content there. Imagine channels as houses. The owner of the house can decide to share ownership with someone else and can decide to prevent any individual from entering his house. In your own house, *you* call the shots. :-) Feel free to create your own channel, and set up your own rules for it. I am fully aware that a lot of the information found in this file can be found in the same or similar form in several other IRC releated FAQ's already. I have tried to combine the best of worlds, by filtering out all mIRC and UNIX related references and adding Leahcim Javachat specific problems and questions. I hope I was succesful. All information contained in this file is based on the work and time various people invested by answering questions in the Usenet alt.irc newsgroups and in the already existing IRC related FAQ's. Of course I am the only one responsible for all omissions and mistakes in this file, but I hide behind the usual disclaimers.... Feel free to visit us in channel #leahcim for further questions you might have.